Dive weights are an essential piece of equipment for any diver. 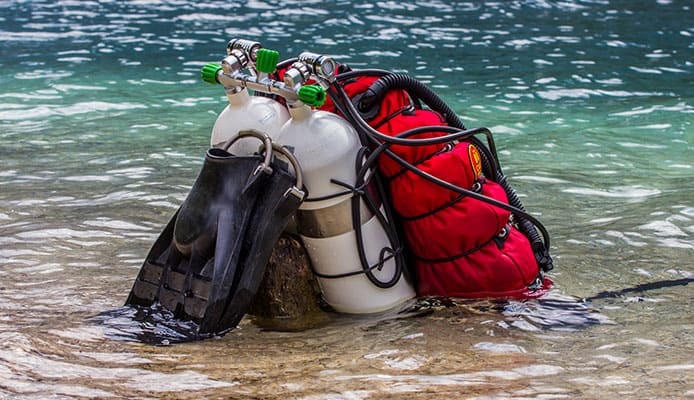 They’ll help you obtain neutral buoyancy needed for scuba diving after diving below the water level. The amount of extra weight needed to descend below the surface depends on various factors and differs from one diver to another. Let’s take a look at the best diving weights to help you select the perfect belt that will improve your dives. Here’s our list of the best diving weights we’ve reviewed and only handpicked the weights that suit your needs. 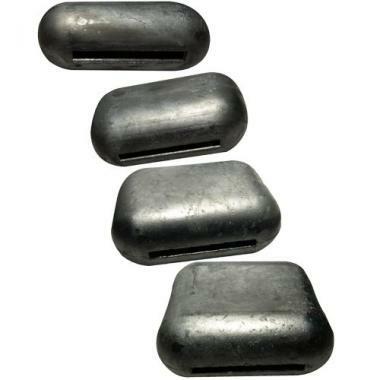 XS Scuba weights consist of a bunch of small coated lead shots and a soft bag material. 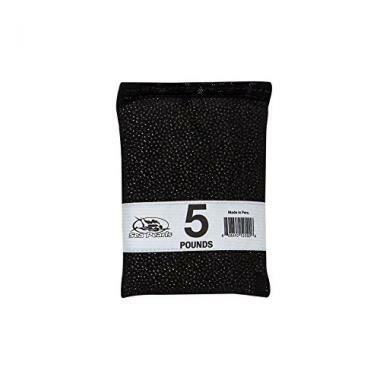 They’re the top rated scuba weights on the market. They prevent bruising since the weights conform to your body shape. All the shots are newly manufactured and have no scrap lead used. The bags have a double needle stitching and are made of nylon mesh. 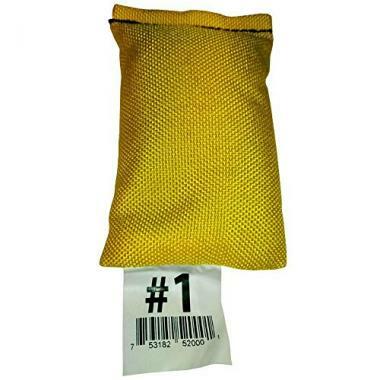 Each dive bag has a coloured label for easy identification. Sea Pearls lead shot are the most comfortable available weights. You won’t find on the market a more comfortable weight if you’re placing them in your weight integrated BCD or weight pockets hanging from a belt. Soft outer material enables the numerous lead shot balls to conform to your body shape or equipment. These weights will take care of the bruises you may get from hard weight resting on your hip bone. Vinyl coated lace thru weights are a favourite for many experienced divers. Unlike soft weights, they increase your stability while in water and are lighter out of the water making them easy to handle. They’re also very comfortable to wear due to rounded edges and curved inner surface. They’re durable because they’re manufactured with antimony and are resistance to deformation. Vinyl coating is bonded to the weight chemically to prevent peeling and colour fading. 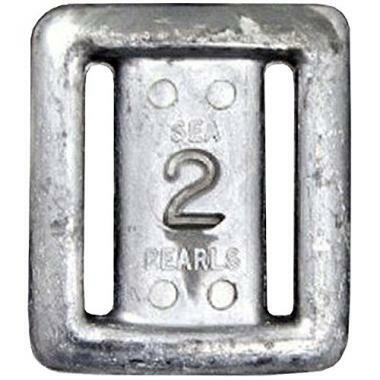 Sea Pearls uncoated weights come in 8 sizes and are lace-thru-style for more comfort. All sizes use similar inside-radius for conformity. The edges and corners are round and do not damage or bind exposure suits. Belt webbing paths are aligned into the weight, both on front and back for comfort. Strong thick cross section and wide belt slots prevents clamping of weights on your belt when dropped. Antimony is harder than plain lead and resists deforming. If you want your hips to get relieved from all the weight from your weight belt or when you tank gets to buoyant at the end of a dive or just wants a simple weight pocket to tie on your weight belt, then Pocket scuba weights can help. Pocket attaches easily by sliding over weight belt webbing or the end of any 5.1 cm cylinder band depending on the spot you’ll hang the pocket. 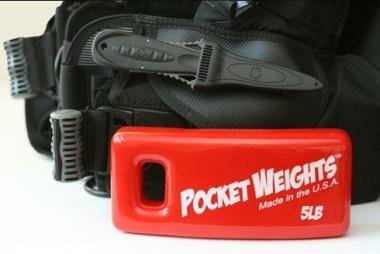 Pocket scuba weights are ideal for adjusting your trim. 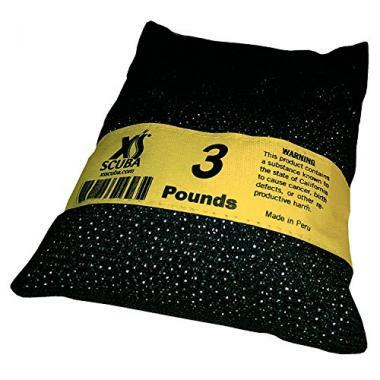 Scuba weights are made of a soft bag material that makes them comfortable. The weights prevent bruising and conform to your body shape. No scrap lead is used and shots are newly manufactured. The bags are made of heavy-duty nylon mesh with a double needle stitching and have coloured labels for easy size identification. 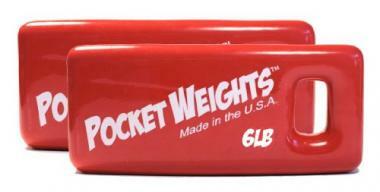 The weights come in sizes of 1 – 5 pounds. Sea Pearls bullet style weights are more comfortable and accurate since the weight belt threads via the center of the weight instead of multiple slots. Weights are manufactured with tin (lead alloy) and antimony which makes them resistant to deformation. These are the most inexpensive and common type of weight-belt for scuba use. They’re uncomfortable because they dig into the diver’s hips. They consist 2-3 inch nylon belt with a quick release buckle onto which lead weights may be coated or uncoated of varying weights that range from 2-15 pounds. These are systems built into your BCD to eliminate the need to carry a separate belt. They’re more comfortable than weight belts but make your scuba BCD unit heavier making it difficult to move around before and after the dive. It’s easy to add and subtract weights from this weight belt in order to adjust buoyancy after every dive. They’re also comfortable as the weights don’t dig into the diver’s hips. They comprise of a regular nylon belt with pockets running along the length of the belt. Hard weights are used by dive instructors to anchor equipment down. Also, divers completing marine or coral surveys weigh underwater survey equipment when swells are changeable. Fresh water has a low density while the density of salt water is high making you more buoyant. To reach neutral buoyancy in salt water, you’ll need more weights. You’ll need more weights if your wetsuit is thicker because the neoprene material from which a wetsuit is made contains millions of air bubbles that make it buoyant. There are many types of weights; ones that are integrated into your scuba BCD and those that rest on a weight belt around your waist. There are both hard and soft weights; hard weights are uncomfortable because they don’t conform to the body causing them to dig in and easily gets damaged when dropped on a hard surface. Soft weights are flexible and conform to your body shape. Unlike hard weights, they aren’t damaged when dropped. All cylinders start negatively buoyant. When Steel cylinders are used, they become neutrally buoyant while aluminium cylinders become positively buoyant. A: Diving weights are used when diving underwater to balance buoyancy. This allows you to offset the buoyancy of your scuba tank, the gasses in your body and your wetsuit. 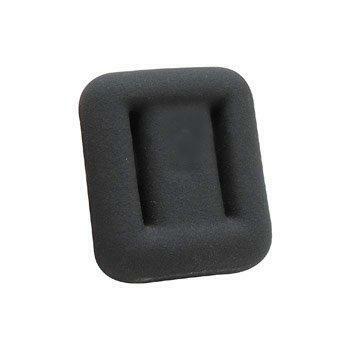 They provide effective positioning while in the water and help you stay in the correct position. Q: What Are the Benefits of Using Scuba Weights? A: Divers use scuba diving weights and belts to help in controlled emergency swimming ascent to stay submerged. A scuba diving belt is used for recreational diving and has a quick release buckle that drops the weight urgently during an emergency. You’ll be able to fine tune your scuba trim weights, the distribution of your weight from head to toe, side to side and front to back when using diving weights and belts. This will help you maintain a horizontal swimming position without rolling to one side or your feet rising/sinking and keep your scuba fins off the reef. 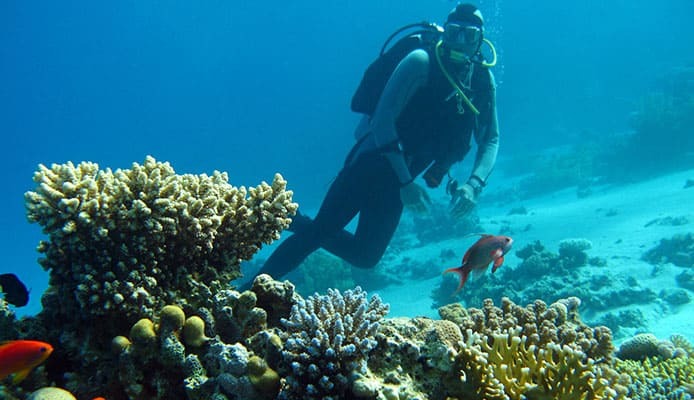 A scuba divers weight belt will also conform to your body shape and enable you add or remove weight easily. 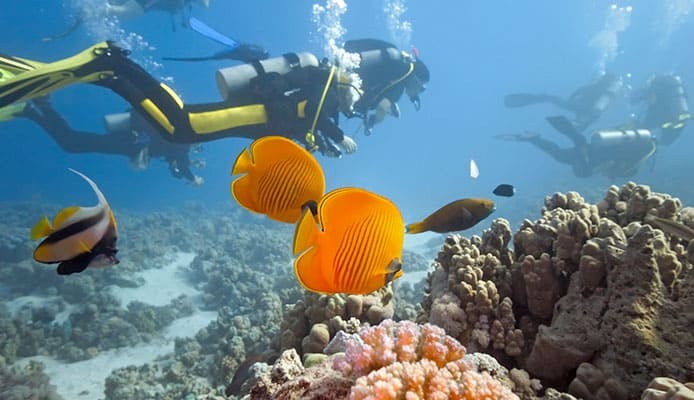 Different underwater environments can affect your buoyancy. Thus, being knowledgeable about how and when to make the necessary adjustments is a crucial skill you need to cultivate. Perform some test runs in a above ground pool using different types of weights to help you find out what suits your needs best.